Red Oriental rugs in traditional designs for beautiful floors. Ines Power-Loomed Rug, 8' x 10' Lauren by Ralph Lauren Camille Power-Loomed Rug, 5'1" x 7'6"
Elegant scrolling leaves and branches create a sense of movement around larger floral medallions in this traditionally-styled Lauren by Ralph Lauren area rug. With a vivid field color of navy and a stylized red border, this rug's palette evokes old world charm. Made using easy-care synthetic yarns in a medium cut pile, this rug is soft yet durable enough for any room in the home or office. 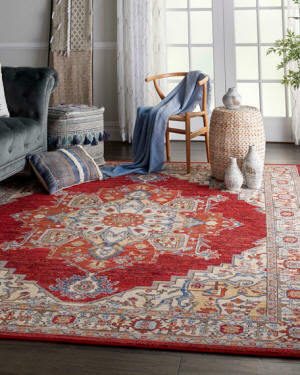 Red Create a look of regal timeworn elegance with this Lauren by Ralph Lauren area rug. A classically restrained field and border of florals and angular palmettes work beautifully in shades of beige, red, and blue. Made using easy-care synthetic yarns in a medium cut pile, this rug is soft yet durable enough for any room in the home or office. Red Elegant scrolling leaves and branches create a sense of movement around larger floral medallions in this traditionally styled Lauren by Ralph Lauren area rug. With a vivid field color of navy and a stylized red border, this rug's palette evokes old world charm. Made using easy-care synthetic yarns in a medium cut pile, this rug is soft yet durable enough for any room in the home or office. This rug is hand knotted, imported from India. The lush dense pile is 100% New Zealand wool and Sari silk. The nouveau-chic look has bright pops of color all done in a pile of pure silk. This rug has an on trend Bohemian look that will be a statement piece in any setting. Orange pattern With rich, luscious detailing and a vibrant feel, this rug brings life to any space. Hand-tufted of pure wool with strong cotton backing, these traditionally beautiful rugs can withstand even the most highly traveled areas of your home. Red Traditional rug. Hand knotted of hand-carded wool. Handcrafted, hand-tufted traditional rug. Wool/viscose. Ivory/pink A fusion of traditional and transitional motifs, this gorgeous rug features an elegant pattern that works well in a variety of settings and warms any room with its rich hues. Red Handcrafted, traditional rug. Wool/viscose. This plush rug proves the staying power of traditional designs and goes one better by offering an interpretation in up-to-the-minute colors. In a special class of its own, this richly colored rug emulates designs and characteristics found in authentic, antique Oushak rugs. This impressive handmade rug offers a versatile transitional design featuring thick-bodied pile, chunky knots, and beautifully saturated colors. Handmade rug. Hand knotted of wool. Gray/eggplant Hand knotted. New Zealand wool. A special heirloom wash produces the subtle color variations that give Oushak rugs their distinctive antique look Handmade Serapi-style rug. Hand knotted of New Zealand wool. Cotton foundation. Hand washed, sun dried, and hand trimmed. Low pile rug. Hand knotted of wool. Cotton canvas backing. Hand-knotted rug. New Zealand wool. Cotton foundation. Cream/red Serapi-style rug. Hand knotted of wool on cotton foundation. Hand washed, sun dried, and hand trimmed. A tight design of sweeping vines spans the center of this dramatic rug in rich red. Hand tufted of wool using hand-spun yarns. Cotton backing. Handmade rug. Hand-knotted wool pile on cotton weft. Rust Rug features a traditional Afghan/Persian tribal design. Hand knotted of wool. A unique dyeing process and the use of blended wools produce colors and shades once only achieved with vegetable dyes. Carefully crafted by master weavers in a strikingly unique color palette, this Serapi reproduction rug has been hand washed and sun dried to fully develop and accentuate the lustrous nature of its fine wool. Rust/aqua Rug hand knotted in the antique weave style of master Indian weavers and then saturated with color. New Zealand wool pile on a cotton foundation. Red Hand-knotted from luxurious New Zealand wool pile by master weavers, this Serapi pays homage to the traditional rug making methods of old-world Indian craftsmen. Hand-washed and sun dried, this masterpiece is hand-trimmed to accentuate the brilliant hues and natural qualities of the wool. With a whimsical spirit and sophisticated flair, the Genesis collection features an assortment of hand-tufted rugs sure to liven any contemporary home. Punctuated by bold and neutral hues, the Combs design's geometric motif calls on mid-century modern style. Rust red, orange, and hints of gold accent the neutral gray tones for a unique colorway on this plush, ultra-soft accent. Gray Handcrafted, transitional rug. Hand-knotted bamboo silk. Resembling real silk, art silk, this artificial silk is extracted from bamboo stalks. Bamboo silk has a lustrous sheen to one side and matte on the other side. The laid-back style of this decorative area rug is rich with west coast vibes. The graphic designs take a tip from tribal motifs, using repeating geometric patterns to fill the colorful field of each accent rug with windowpanes, arabesques and bold concentric diamonds. Crafted with care using traditional hand-woven techniques, soft cotton fibers give the floor covering a casual feel. Contemporary rug. Hand tufted of wool. Cotton backing. Purple, Denim Hand-tufted rug. Viscose/wool blend. Medium pile. Cotton canvas backing. Purple Luminescent radiance and understated modern elegance are the hallmarks of these richly hued rugs. Silk-like fibers impart a subtle sheen in a velvet-like textural quality.